Shadows creep through the lands of Middle-earth, as whispers of new evils in Mirkwood and Mordor spread among the Free Peoples of Elves, Dwarves, and Men. As the shadow rises with festering evil and corruption, new heroes are needed to protect Middle-earth. Fantasy Flight Games have announced The Lord of the Rings: Journeys in Middle-earth, a fully cooperative, app-supported board game for one to five players, inviting you to become the greatest heroes of Middle-earth! The Lord of the Rings: Journeys in Middle-earth lets you embark on your own adventures in J.R.R. Tolkien’s iconic world, embodying heroes of the Free Peoples and fighting back against the oppressive might of Sauron. You’ll battle villainous foes, make courageous choices, and strike a blow against the evil that threatens the land—all as part of a thrilling campaign that leads you across the storied hills and dales of Middle-earth. Each individual game of Journeys in Middle-earth is a single adventure in a larger campaign. You’ll explore the vast and dynamic landscapes of Middle-earth, using your skills to survive the challenges you encounter on these perilous quests. As you and your fellow heroes explore the wilderness and battle the dark forces arrayed against you, the game’s free companion app guides you to reveal the looming forests, quiet clearings, and ancient halls of Middle-earth, while also controlling the enemies you encounter. Whether you’re venturing into the wild on your own or with close companions by your side, you can write your own legend in the history of Middle-earth. Central to your unfolding tale are the heroes that you and your friends choose to form your Fellowship in Journeys in Middle-earth. Each of the six heroes included in the Core Set is utterly unique, lending their own mix of might, wisdom, agility, spirit, and wit to the trials that present themselves with every adventure. A Dwarf like Gimli, for example, burns for battle, and his prodigious might and spirit serve him well in confrontations with Orcs or other enemies that cross his path. As a small Hobbit, on the other hand, Bilbo Baggins primarily shies away from fights. With a clever mind like his, though, he has little need for protection from other characters. Instead, he can cling to the shadows as a self-sufficient burglar who won’t easily succumb to fear. There are six heroes to choose from in Journeys in Middle-earth, and each will be explored in future previews from Fantasy Flight Games! Each hero’s skills and special abilities form a foundation for you to build on, but a hero is far more than a collection of stats. 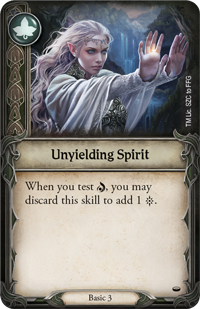 As you interact with the creatures and locations of Middle-earth, your hero will rely on their own unique deck of skill cards to overcome the challenges they face. Rather than leaving a player’s fate up to a roll of the dice, the heroes must turn to their skill deck while exploring, encountering threats, attacking enemies, and interacting with the people of Middle-earth. To perform a skill test, a player simply reveals cards from the top of their skill deck equal to the value of their tested skill, hoping to reveal enough success icons to pass the test. Testing his agility, Bilbo reveals three skill cards from his deck, showing one success symbol! Revealing these skill cards determines if you succeed at your tests, but that’s far from their only purpose. Your skill deck also captures the essence of each hero. In addition to the icons in the upper left corner, each skill card also offers valuable abilities that can be used when you take the time to prepare those skills—removing them from the skill deck and placing them below your hero card. Preparing your skills lets you access powerful abilities, but it also means those cards are no longer in your skill deck, and no longer helping you succeed at skill tests. You’ll need to carefully choose which skills to prepare, balancing their effects against your need to pass your skill tests! Every hero boasts their own mixture of stats and special abilities, but the composition of each hero’s skill deck is also different. All heroes have access to certain basic skill cards, like Unyielding Spirit, but every character also has their own set of personal skill cards—and as your adventures progress, your hero has the opportunity to grow and evolve, gaining more and more powerful skills! In addition to the hero’s personal skill cards, your hero’s skill deck is also determined by choosing one of six roles! These roles invite you to play to different strengths within your Fellowship—in one adventure, you may lead your friends down unseen paths as your group’s Pathfinder, while in the next you could become a Hunter, attacking the enemies that stand in your way. You could take on a new role in each new adventure or choose to deepen your skill in your current role, ultimately giving you the freedom to experiment with dozens of combinations of characters and roles over the course of a campaign. No matter what, you have the final say over how your hero approaches their quests in Middle-earth. Once you’ve selected your hero and your role, your journey is about to begin. The wild heights, mist-capped mountains, rolling plains, and darkling forests of Middle-earth await, and there’s no telling what you could find around the next bend in the road. In the first scenario of your campaign, you’re introduced to the journey map of Journeys in Middle-earth—a series of lavishly illustrated, double-sided tiles that are added to the board as you continue to explore. This are the primary building block for many of your adventures, and the possibilities for what you can encounter are nearly limitless. You may find yourself trekking through a primeval forest, investigating ancient ruins, or delving into a gloomy cave or Dwarven hall. As you move from place to place, you’ll be able to further investigate your surroundings and explore by interacting with search, threat, and person tokens in the app. For many scenarios, you’ll remain solely on the journey map, but for more tactical situations like a micro-scale, combat-oriented adventure, you’ll move from the journey map to the battle map—a smaller board that you can fill with terrain, creating an Orcish encampment, a ruined building, or even more unusual locations. Whether your journey takes place among the rocky hills of Eriador, deep in a musty cave, or in an old fort overrun by Orcs, your campaign can take you between far-flung adventures on the journey map or fast-paced, frenetic action on the battle map! No matter which map you find yourself on, the enemies that you face in Journeys in Middle-earth are each controlled by the game’s companion app, freeing you and your fellow heroes to focus entirely on working together to defeat the forces of evil. The world of Middle-earth is not a safe place for heroes or adventurers. In your travels, you’ll be brought face-to-face with marauding Orcs, towering Trolls, and darker enemies, all brought to life with the game’s 25 stunning enemy miniatures. The companion app also gives each of these enemies their own unique behaviour, so as they hunt and attack, you’ll need to adapt your strategies to counter the monsters that you face. Ancient kingdoms once spanned the realm of Arnor, kingdoms that now lay in ruin. The Free People who still inhabit these lands are scattered, simple, and few. Beyond their poorly patrolled borders, an unknown darkness gathers, and only a small band of ostracised Rangers has taken notice of the threat. As your quest begins in Jouneys in Middle-earth, you will soon be swept away on a series of adventures that spans across Middle-earth. Each of your adventures is but one part of the greater Bones of Arnor campaign that could take you in any number of directions. Throughout the 14 adventures of this campaign, you’ll unravel mysteries, fight enemies, and further the story as you chase down missing relics and discover a threat that looms over all Free Peoples. But this story does not remain the same between one playthrough and the next. Whether you’re searching for lost treasure or seeking out forgotten lore, Journeys in Middle-earth is continually surprising and highly replayable, adjusting the enemies and allies that you encounter, the events that plague your heroes, and even the size and layout of the map with every adventure. Beyond the individual adventures, the overall campaign also features branching narratives and side quests that you can unlock. Combine that with your options for upgrading your hero’s power, finding new items or titles, and diversifying your skill deck, and it’s plain to see that no matter how many times you play the campaign, you’ll live a new story each time. Adventure awaits for those bold enough to seek it. Gather your friends, pack your bags, and turn back the shadow with Journeys in Middle-earth! Look for The Lord of the Rings: Journeys in Middle-earth in the second quarter of 2019, and for more information head to the Fantasy Flight Games website! Asmodee UK is an established distributor of gaming product and collectibles to the UK and Europe. Asmodee UK is the trading name of Esdevium Games Ltd.